This past weekend a good friend of mine got married; he and his wife asked me to provide all the beer for the celebration. 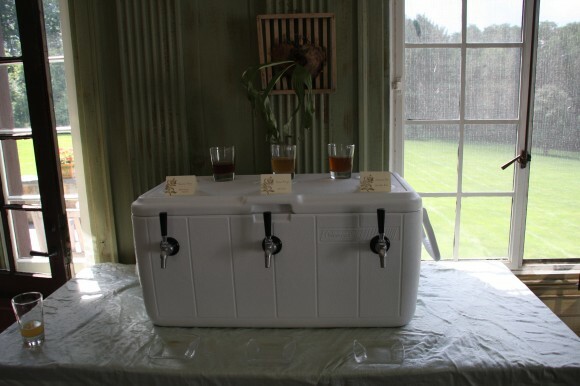 Using a 3 tap jockey box we self-served 3 beers at the rehearsal dinner and had 3 different beers served by the caterers at the reception. American Amber, Kölsch and a British Ale were served on Friday night, with German Lager, American Wheat and American Brown Ale being featured the next day. The beers were outdoors in the middle of a 90 degree day for hours, but cooling potential of the jockey box kept pace with the demand. This was the largest party where my brew was the sole beer available, 120+ people. It was the first time I was completely out of the picture when my beer was being served. After setting up the jockey box and showering for the pictures, my boy and I looked out the window and saw the caterers had completely broken down the bar back we built and were moving my kegs and jockey box. While crawling under the table in my brand new suit to figure out which beers were flowing on which taps for them, I gained a deeper appreciation for the need of a draught beer guide published by the Brewers Association. All told, they did a great job. 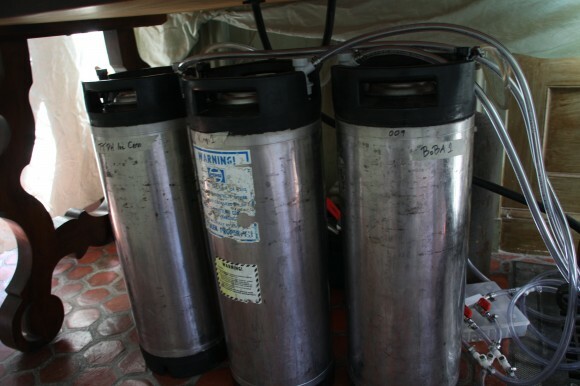 We had two kegs of each beer so we set up the 3 beers on the porch where the reception was, and had the spare kegs down the hill in the tent for the dinner. 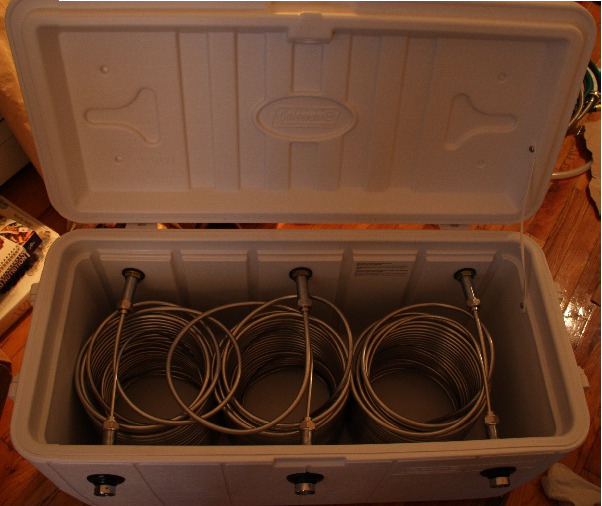 That way they only had to move the serving gear and the beers wouldn’t get shaken up carrying them back & forth. One of the brown ale kegs was also overcarbonated, but I explained to the head caterer about leaving it off the gas until it wasn’t pouring anymore. 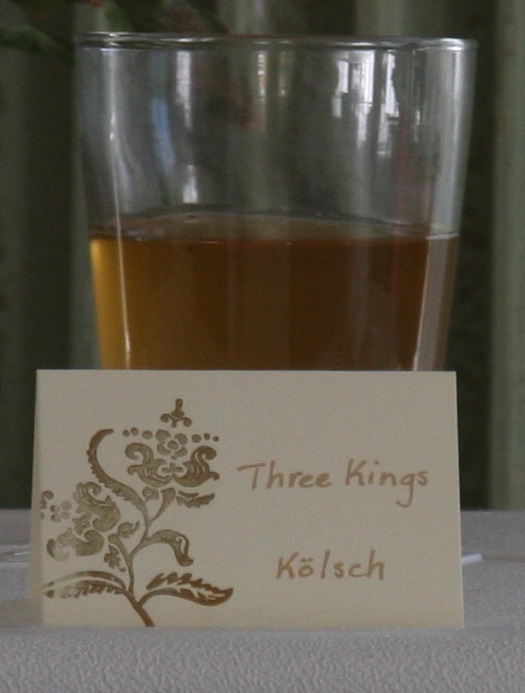 Then the carbonation level and pour came to a nice balance by the time the reception really got going. The feedback I received was wonderful. Comments were ranging from, “How do you get so much flavor in your beer?” to, “We live on California craft beer and we loved all the beers you had.” All the kind words were a mighty ego boost, but I was especially proud of the stuff people were saying behind my back without having met me yet. They aren’t just being polite to your face or falsely enthusiastic. I met a couple people who are trying their hand at homebrewing. We got to talking processes and I offered what I thought was some sage advice to hopefully help them improve their own brews. My “coaching tree” continues to expand. One thing that made this such a great success was preparation. I brought spare parts for everything; I’m not sure how a faucet would actually break, but I still had spare faucets. Leak detector was a clutch item to bring along, my gas manifold had a leak despite testing prior to packing the car. With leak detector I found and fixed the issue in about 5 minutes with a fresh wrapping of teflon tape. Like with athletics, visualization before the event allows you to anticipate problems and prepare yourself to deal with them. I should have more photos later, but these are all I got on my own camera. I shot these the morning after the rehearsal dinner while the jockey box was still set up from the night before. People were able to self-serve all night and even for a little hair-of-the-dog until we moved the jockey box after lunch.